The Riemann projection is associated with the mathematician Bernhard Riemann (1826-1866), and gives a method of projecting the contents of a finite spherical surface onto an infinite flat plane. We place the sphere onto the plane, so that its South Pole is touching the surface, and then we draw lines from the North Pole to the plane. After leaving N, each line intersects one (and only one) point on the spherical surface, and one (and only one) point on the spherical plane. Every point on one on one of the two surfaces has its corresponding point on the other. As long as we don't mind making a vanishingly-small pinprick in the spherical surface at its North Pole, the two surfaces are topologically identical … we can take our pin-mark, stretch it to a finite-sized hole, and then stretch the resulting bowl-shaped surface to cover the full infinite plane. We can also imagine this as a simple optical projection – if the sphere is a hollow transparent surface and we place a lightsource at N, then anything drawn on the sphere will project shadows onto the plane. Einstein used the projection in his "Geometry and Experience" lecture, as an aid to visualising the idea of a closed finite universe: There's also a nice Riemann Sphere animation on YouTube, courtesy of the American Mathematical Society, and a nice image at Encyclopaedia Britannica. Now although we don't usually want to make this sort of projection (unless we're working on something a bit abstract, like Moebius transformations), the "Riemann Sphere" projection was psychologically important for physics, because the thing was fairly easy to visualise, and because it had such far-reaching implications for geometrical physics. Thanks to the projection, we know that any physics described in sphereland has to have an exact counterpart description in flatland, as long as we scale all our definitions to match. When we lay rulers over the surface of the sphere, rulers near the North Pole have projections onto the plane that tend towards becoming infinitely large, so the plane's surface appears (to its occupants) to be finite, just like the sphere. Similarly, a constant-speed light-pulse travelling around the sphere has a "shadow" on the plane whose speed tends to infinity as the corresponding position on the sphere approaches N . If we take objects and structures whose internal equilibrium is maintained by signals travelling at the speed of light, then as we move these objects away from S, they enlarge. So it takes us the same number of tiles to pave the infinite plane as the sphere. And to the plane's inhabitants, there's no obvious way of telling which tile is the central tile – the internal physics of the plane and sphere are precisely the same. But the intrinsic geometry of a blank plane, on its own, is not the same as that of a sphere. We need to add something – a density-map. In order to recreate the sphere's properties , we need to either project a helpful scaling grid from the sphere onto the plane to describe how scalings need to vary across the plane's surface, or attach a value to each point on on the plane to describe the local scaling. This "density" parameter varies smoothly over the surface, so we're entitled to describe it as a field. We can then say that it's this density-field that deflects light and matter in the plane towards the region of highest density (S), by Huygens' principle. But as Newton and Einstein both pointed out, a variation in the density of an underlying medium, and the associated variation in the speed of light, can both be considered as expressions of the action of a gravitational field. As a crude first approximation, we can say that the unscaled plane description includes a gravitational field that doesn't exist in the sphere description – and yet both descriptions are equivalent. So ... the implication of the Riemann projection is that gravitational fields aren't absolute. We can take a physical description that works, and stretch and squash our reference-grid in weird and silly ways, and as long as we invent compensating gravitational fields that vary in sympathy with our fictitious distortions (causing space's contents to nominally stretch and squash and distort to fill exactly the same region as before), the final predictions should be identical, regardless of which grid we use. Within a space defined by that grid, these fields are physically real. And, said Einstein, we could also run the process backwards. We can place an observer in a genuine gravitational field, and allow them freefall acceleration, and for them, that field will no longer exist in their local physics ("a freefalling observer feels no gravity"). If Eötvös' Principle (that everything falls at the same rate in a gravitational field) was right, and gravity affected everything equally, then we had to be able to produce a geometrical description of gravitational effects ... and by allowing space to be warped, we could then eliminate gravitational fields from our description as a separate effect. The background gravitational field was simply space(-time), and what we normally thought of as conventional gravity was simply the result of curvature, and of curvature-related variations in projected density. In practice, things were a little more difficult than this: Riemann and co couldn't get their curved-space models to work using curvature in just three dimensions, so a geometrical theory of gravity had to wait until Einstein had noticed the argument for gravitational time dilation, and that it led to curvature in four dimensions. Einstein also decided to use a "frame-based" approach, which led to some simplified geometries being cross-mapped and projected that sometimes didn't correspond to actual physics, or to the shapes that more general principles said ought to be there. I'll deal with the topological failure of the current default version of the general theory of relativity in a future post (or two). If anyone can't wait, it's in the book. Physicists used to tell me was that physics was a special subject, because you never had to worry about the possibility of fraud. Their reasoning was that You Can't Fake Physics. If you make up an experimental result that isn't right, you're doomed to be found out when other people try the same experiment and can't replicate your result. It's a dumb thing to do, and no physicist would ever be stupid enough to try. However, it might be more accurate to say that perhaps no sane physicist would try to fake a result that they believed to be wrong. Faking a correct result may be cheating, but doesn't carry the same risk. It's much more difficult to spot a fake result when it agrees with everyone else's results and with what everybody expects to happen. We can sometimes spot a "false positive" when a theoretical prediction that is successfully verified later turns out to be wrong, or when an experimental technique later turns out to be impossible, or impossible to conduct to the claimed accuracy. When this happens in an experiment that contradicts current theory, we usually rip the person responsible to shreds, and accusations start flying of scientific fraud. When it happens in an experiment that agrees with current theory, we're usually more charitable, and tend to say that perhaps the experimenter was simply mistaken, or overcome with a little too much enthusiasm. There's such a large grey area for honest mistakes, or the unconscious selection of "good" data (or simple wishful thinking) that a certain amount of bad science probably slips under the radar without being spotted, and it's not often that we find a "bad" result supporting a "good" outcome that's really so profoundly impossible that people are forced to consider using the "f" word. One candidate case happened in 1955. Researchers had been wanting to create artificial diamonds since at least as far back as Nineteenth Century. When H.G. Wells published his short story "The Diamond Maker" in 1894, a number of researchers had already been trying approaches with varying degrees of optimism and claiming positive results, including James Ballantyne Hannay in 1880, and Nobel Prize-winner Henri Moissan (also in 1894). One of the wildest attempts to create artificial diamond was carried out by John Logie Baird, who briefly blacked out of part of Glasgow when he deliberately short-circuited an electricity substation's power terminals across a graphite rod embedded in reinforced concrete (the story goes that he couldn't work out how to get the thing open afterwards, and it ended up at the bottom of a river, unexamined). The potential financial payoff for anyone able to create artificial diamonds on demand was obvious, and by the 1950's there had been more reported (but often disputed) successes, and competing researchers were trying desperately hard to be the first people to produce a proper, replicable, accepted process that definitely did produce diamonds. One team in particular figured that they were on the edge of actually achieving it. They had the theory right, they had the equipment right ... the only problem was that their pressure-vessel obstinately refused to cough up any diamonds. It was desperately unfair. They'd done all the work correctly, and the experiment refused to come out the way it was supposed to. They needed a diamond to get further funding. From their perspective, they probably reckoned that they deserved a diamond. It was necessary for their future research. Science needed a diamond! And a diamond dutifully appeared. They got new funding, bought new equipment and replicated the result, others managed the same thing, and everyone was happy. Except that ... someone went back and checked the calibration on the original pressure reactor and found that its readings had been significantly "off". The pressure-vessel had been running at too low a pressure for diamond to form. 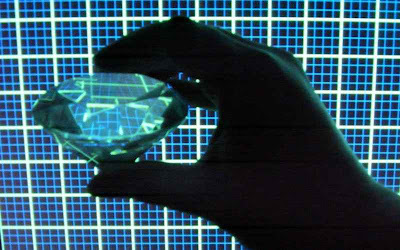 With hindsight, their original artificial diamond seemed to have been a physical impossibility. So how did it get there? Three of the four original team members put their names to a letter to Nature in 1993, explaining that subsequent spectral analysis of the "run 151" diamond years later had shown that it appeared to have the characteristics of a natural gemstone rather than those of an artificial rock. The experimenters had carried a small stock of natural diamonds for research purposes, and it seemed that one of those had somehow found its way into the pressure vessel during setup, and been "fortuitously" discovered after the experiment. It's quite a nicely- and elegantly-written letter, but the authors must have been acutely aware that to most people, the idea that one might "accidentally" lose a real diamond inside an apparatus designed to create artificial diamond, in such a way that it could then be rediscovered and used to get further desperately-needed money ... if this happened in any other field, we'd tend to assume deliberate fraud. Another thing that might surprise some outsiders is that although the announcement that the experiment had been a success was made in 1955, the retraction didn't happen until 1993, nearly forty years later. For Twentieth-Century experimental physics, this wasn't actually all that unusual – there seemed to be an unspoken "gentlemen's agreement" that if someone had claimed a "correct" result that they shouldn't have, that the community would hold off making too many pointed suggestions in print until some time after the person concerned was safely dead. This was probably a great way of avoiding public controversies, but it also meant that we never really got to the bottom of what had happened in many of these cases. If you weren't supposed to go public while someone was still alive, but you couldn't suggest fraud after they were dead (because it was unfair to level that sort of accusation at someone when they couldn't defend themselves), then it meant that anyone who did get up to no good had a decent chance of not being publicly outed, in print, ever. By the time a critical report could be written, the people with first-hand knowledge of what had really happened might have all died off. By avoiding investigating these cases until after it was too late to reach a conclusion, the physics community probably did manage to achieve a nominal "no confirmed mainstream fraud" result. But that result was itself not especially honest. Things are now looking up. Berkeley recently went public very quickly about problems with the work of two physicists (in two separate cases) who seemed to have been almost routinely fabricating data to get their "world-class" results (Victor Ninov and Jan Hendrik Schön), and there've now been a few more speedy "outings" of scientists caught misbehaving. So from now onwards, the more temptation-prone members of the physics community know that if they gain fame and fortune by faking data, universities and comissioning bodies won't necessarily hush the thing up for them. But for research published before 2000 (or perhaps before ~2005) ... be more careful. A certain number of the "jewels" in physics history aren't quite what they appear to be. With the conventional Fibonacci Series, there are two standard ways of constructing the series with interlocking squares. In the version on the left, we put two squares side by side, add another square to the longest side, and repeat, darting from left to right as we decide where to put the next square. In the version on the right, we constantly circle the block to find the next addition site, and end up with a spiral pattern. 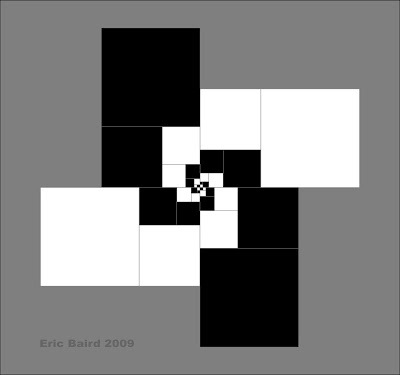 Finally, here's a "quad-spiral" version of the tiled squares. ... This is why all attempts to obtain a deeper knowledge of the foundations of physics seem doomed to me unless the basic concepts are in accordance with general relativity from the beginning. This situation makes it difficult for us to use our empirical knowledge, however comprehensive, in looking for the fundamental concepts and relations of physics, and it forces us to apply free speculation to a much greater extent than is presently assumed by most physicists. I do not see any reason to assume that the heuristic significance of the principle of general relativity is restricted to gravitation and that the rest of physics can be dealt with separately on the basis of special relativity, with the hope that later on the whole may be fitted consistently into a general relativistic scheme. I do not think that such an attitude, although historically understandable, can be objectively justified. The comparative smallness of what we know today as gravitational effects is not a conclusive reason for ignoring the principle of relativity in theoretical investigations of a fundamental character. In other words, I do not believe that it is justifiable to ask: what would physics look like without gravitation? " Some people really don't like the implications of what Einstein seemed to be saying here about his own theories. Some online physics people in the past have insisted that Einstein couldn't possibly have said such a thing, but I've checked paperback reprints and the original 1950 SciAm publication and there it is, in black and white. That's what he said. Einstein's point is entirely logical, and supported by the historical record. If we look at the background to the development of relativity theory, notably the Newtonian Catastrophe, we find that the version of general relativity that we ended up with, with special relativity providing an underlying flat-spacetime layer, was not just not inevitable, it actually seemed to depend on a rather unlikely-looking chain of historical accidents. Probablistically, it really shouldn't have happened like this. We should have understood that gravity slowed time a century before Einstein eventually noticed, shortly after John Michell had predicted gravitational shifts way back in 1783. With the benefit of that missing piece of information, Gauss and Riemann and Clifford and friends ought to have been able to complete their curved-space projects (allowing curvature in four dimensions rather than just three) and should have been able to produce a general theory of relativity in the Nineteenth Century, before special relativity had been thought of. Einstein's special theory was partly a reaction against the aether models that dominated in the absence of a proper curvature-based description, and when Einstein went on to try derive his more ambitious general theory a few years later, he naturally wanted it to incorporate his earlier theory. But special relativity assumed inertia without gravity, and energy-concentration without curvature. Its founding geometrical principles are fundamentally incompatible with key results that arise from the general principle of relativity. Like Einstein said, historically understandable, but not objectively justifiable with the benefit of hindsight. "A technique for controlling the alignment of silver nanowires with an electric field"
"Electric field can align silver nanowires"
Another (slightly random) example of materials "memorising" and recreating the effect of an applied potential is what happens to an external house-wall when your guttering is leaky. Suppose that rainwater runs down the outside of your house and creates a bit of a damp patch on the inside wall. If the patch is bad, it's tempting to try to dry this out quickly from the inside by training a blow heater on the offending splodge. You evaporate the water at the surface, more water moves in from within the wall to take its place by capillary action, and you hope that at some point, the process will stop. You hope that you'll dry out the surface deeply enough that the rest of the water will stay put, somewhere deep within the wall, and perhaps dissipate. Some of it might work its way to the inside surface over a larger area and evaporate slowly and less intrusively, and some of it might eventually find its way back to the outside, the same way it got in. You hope. But damp spots on walls are pesky creatures ... if you remove the surface water from one place too "aggressively", you're encouraging moisture directly below that section of surface to seep in to take its place faster than the usual seepage rate. In the worst-case scenario, instead of water slowly spreading through the wall in all directions, you're creating a faster directional flow within the wall, with water from a wider region of brickwork and plaster all converging on the extraction point where your heater is trained ... and as it moves, it dissolves salts and minerals from the wall and deposits them where the water is being driven off. If you see a crusty surface deposit forming, you're in trouble – it means that all that material has been dissolved out of the wall, possibly from around the points of greatest proportional resistance to the directional flow that you've created. You've etched a series of tiny micro-channels into the wall that converge on your extraction point, as a microscopic three-dimensional counterpart of how rivers carve channels into their landscape. There might also be a concentration of those salts and minerals within the wall, towards the extraction point. If that happens, then the water-loving salts have created an absorbency gradient within the wall that represents the original flow, and once that piece of wall has dried out, if the dried region butts up against a damper region, the more "salty" part of the wall will draw water into it preferentially. The water will continue moving preferentially towards the most absorbent neighbouring region, following the original gradient ... straight back to your dried-out patch. So what you've done is (1) optimised the wall microstructure to collect water from a large area and direct it towards your extraction point, and (2) created an absorbency gradient in the wall to attract and hold the moisture and recreate the original damp patch. You've trained the wall to take water from the outside and carry it to the exact point on the inside where you didn't want it!